This month we’ll focus our efforts on the west side of the lake, continuing work on removing blackberry and English ivy. We’ll meet along the trail near the log where the turtles sun themselves, which is roughly across from NW 67th street, along the west side of the lake. This is about half way between the Bathhouse Theater and the Small Craft Center (old Aqua Theater). Look for the Friends of Green Lake banner. Be sure to dress for possible April showers and wear long sleeves to protect against blackberry thorns. Please no open toed shoes, as the area is muddy. We will have a variety of tools for you to use and some gloves. If you have a favorite tool and your own gloves be sure to bring them along. Contact Maureen at mokwolek@comcast.net or 206-919-6630 or Andrea andwatts@live.com if you have questions, and especially to indicate you wish to join in. Hope to see you on May 9! Volunteers Needed for Water Quality Sampling at Green Lake! Bring Your Kayak and Make a Difference! Initial comments by Richard, circulated FOGL RECENT CORRESPONDENCE binder for members’ review. 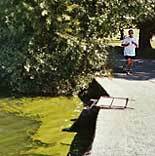 August, 2003 – Green Lake looked like pea soup but smelled like something else. A Friends of Green Lake member explains the alum treatment funding petition to a Park visitor. FOGL collected 1,500 signatures, enough to persuade the Mayor and City Council to include the 2004 alum treatment in the City Budget.